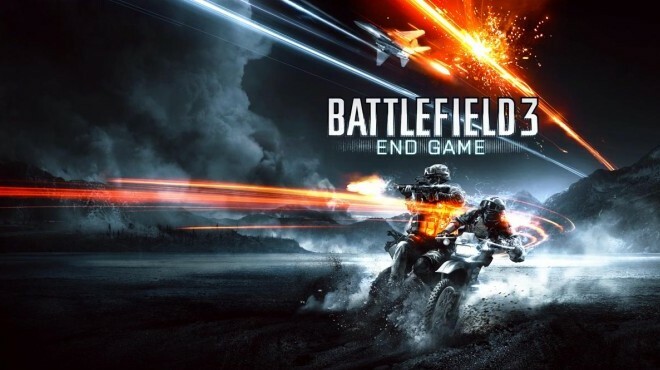 End Game is exactly what Battlefield 3 needed. As Battlefield 3’s fifth and final expansion, End Game fills in the empty spaces with the more-than-welcomed addition of two classic Battlefield game modes, a round of four gorgeous Frostbite 2-powered maps, and a number of new ways to play the game with a set of new vehicles. 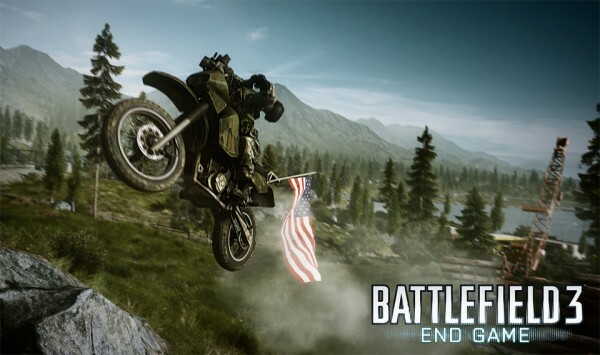 Capture the Flag and Air Superiority instinctively fit right in with Battlefield 3’s now impressive roster of game modes, while vehicles like the new motor-bike and AA jeeps prove to be a natural extension of the vehicular warfare that Battlefield 3 already does so well. Lastly, each new map stands out on its own while providing that true classic battlefield experience. First, let’s briefly cover exactly what you get for the $14.99 USD price tag, or free if you’ve already dropped some cash for a Battlefield 3 Premium membership. 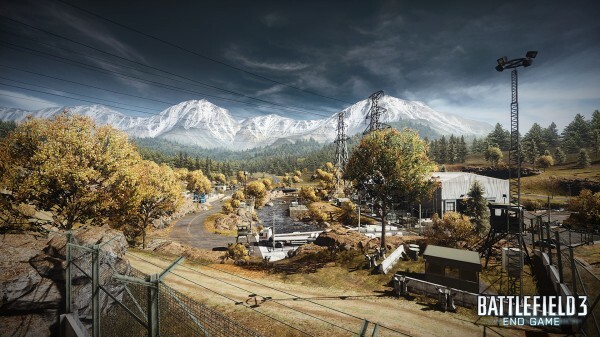 As per previous DLC before it, Battlefield 3: End Game comes packed with four new maps, each based on a different season: Kiasar Railroad (Spring), Nebandan Flats (Summer), Operation Riverside (Fall), and Sabalan Pipeline (Winter). What’s nice about the seasonal theme is that each map carries with it a completely different look and feeling. End Game doesn’t suffer from the lack of diversity that the Aftermath Expansion did only a few months ago. The maps look great too. Kiasar Railroad captures the same natural beauty that Alborz Mountain did from the Armored Kill Expansion, while Operation Riverside shows off a gorgeous fall setting surrounded by rolling hills and snow-covered peaks. End Game’s maps are built to accomodate a number of new vehicles as well. The new motor-bike requires tons of space and, of course, things to jump off of. Luckily, each map allows plenty of room to race around and gives you plenty of opportunities to catch some air as well. 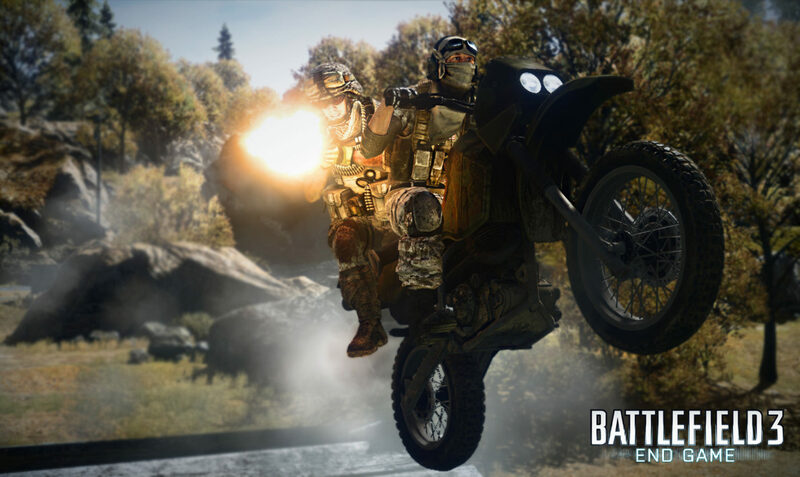 The addition of the motor-bike definitely feels like something Battlefield 3 has been missing its entire lifetime. It fits right in with the gameplay and is a ton of fun to ride. A motor-bike can accomodate up to two players: one driver and one gunner on the back. It’s quick and nimble and can slide around corners or perform wheelies for an extra boost of speed. We’ve already seen some crazy videos like this one showing off some of the insane stunts you can pull off with the motor-bike, and we’re looking forward to more. 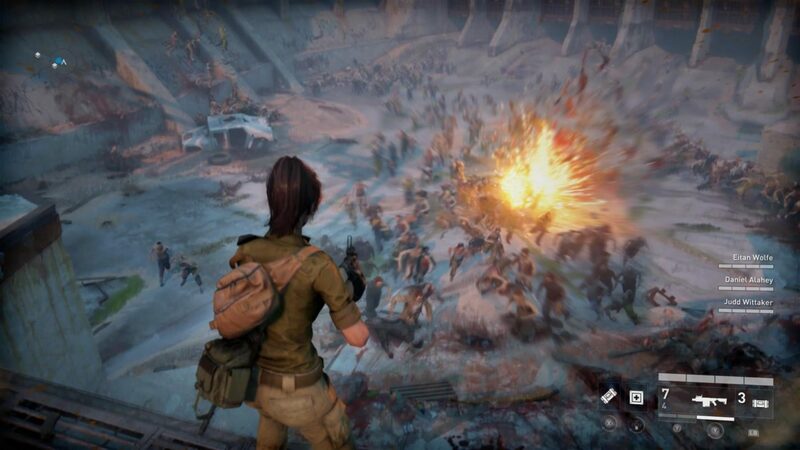 New anti-air jeeps have been introduced to the mix as well, one for each faction, giving players a more mobile AA solution to the threats from above. Since all of the maps include at least one scout chopper for each side (plus attack choppers and jets in Conquest) there’s usually a lot going on in the air, so it’s nice to have the extra bit of defensive power on the ground. Sadly, the AA jeeps don’t seem all that effective. It can be hard to make good use of them, especially since they aren’t very heavily armored. They are best used in teams – one in the driver’s seat and one manning the cannons. Like Armored Kill introduced the AC130 Gunship, End Game introduces the Dropship. Only available in Conquest, the Dropship gives the owning team a chance to call in additional infantry fighting vehicles and provides additional paradrop points when spawning into the Battlefield. It’s a subtle bonus that isn’t overly effective, as some would argue the AC130 Gunship was in Armored Kill. Regarding the maps, in terms of visuals and size, as well as vehicles, it seems that lessons have been learned from previous expansions like Armored Kill and Aftermath, making End Game’s content some of the best Digital Illusions CE has had to offer yet. At long last, Capture the Flag returns from Battlefield: 1942. At default settings, CTF requires you to race to the enemy flag, take possession of it, and bring it back to home base by any means necessary three times before the enemy does. 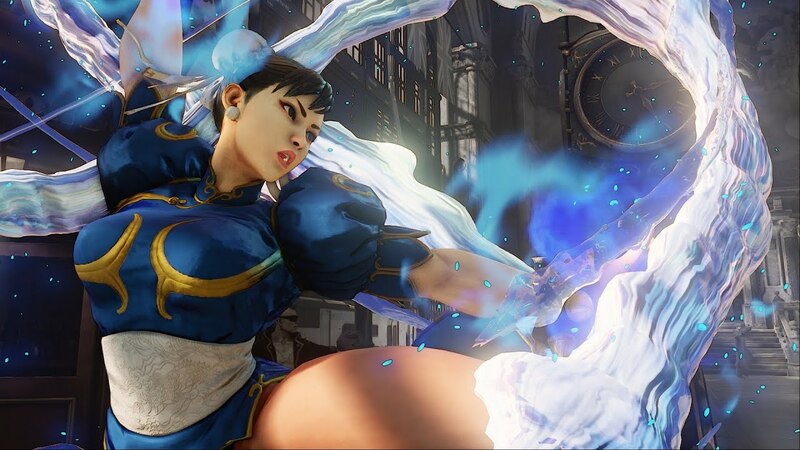 If both teams are stacked pretty evenly and no one can manage the full three points for a win, a built-in timer counts down to the end of the match, either ending it in a tie or giving the win to the team with the most flag captures. Should you down an enemy who’s taken your team’s flag, you must stay within its vicinity in order to retrieve it. Like in Conquest, the more soldiers in the flag’s vicinity, the quicker it will return. Your flag must be at your home base in order to successfully capture the enemy’s. Because distances between each flag on all four maps are substantially greater than in most other iterations of the same game mode in other shooters, Battlefield 3’s distinct vehicle-based gameplay really comes into play here. It’s also why the game mode just feels like it belongs. 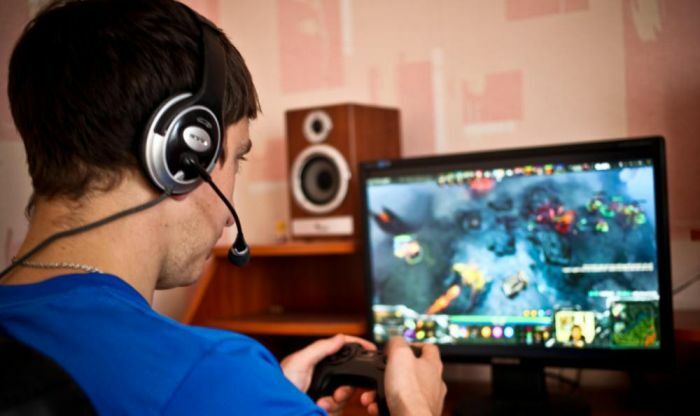 With the numerous sandbox elements granted to each player, there are a ton of different ways to accomplish your goal. Each class of vehicle plays a different role and it’s up to you to decide how to best utilize that role. Currently, the most popular method seems to be by way of the motor-bike, using tanks and aerial vehicles to stop pursuers in their tracks and clearing a path for the flag runner. Motor-bikes tend to play a larger role in CTF than in any of the other games modes, understandably. CTF is all about speed and precision. What better way to strike at the heart of your enemy than with two soldiers on a motor-bike? In modes like Conquest or Rush, bikes serve primarily as a method of quick transportation, albeit an extremely fun method of quick transportation. Air Superiority, a game mode returning from Battlefield 1943, is a lot more fun than I had originally anticipated, and much more enjoyable than Tank Superiority, its tank-based counterpart, introduced in Armored Kill. When you have two teams of 12 players, each of whom get their very own jet, that’s a lot of dog fighting going on at one time and it can get hectic, in a good way. Though, that isn’t to say the fun will last forever. Capturing bases, fending off heat seekers, and gunning down your opponents can only go so far. Eventually, it gets old, as there really isn’t a whole lot else to do. Despite this, the game mode still does have its very important place in Battlefield 3. The true beauty of Air Superiority lies in the fact that it gives those normally too frightened to fly jets in other game modes a chance to fool around, get more accustomed to flying, and unlock some stuff without the worry of upsetting others by wasting a perfectly good ride. What’s better yet is that anyone can earn points by capturing bases, which means you’ll unlock items much faster than in modes like Conquest. A few good rounds of Air Superiority should get any rookie pilot up and running with a decent amount of confidence in a short amount of time. It’s too bad it only took DICE until now to introduce the mode, but better late than never. It’s noteworthy that pilots can no longer eject themselves from their cockpits, meaning you get the kills you deserve. It would have been nice if a few more obstacles were thrown into the mix as well. Nebandan Flats features rows of wind turbines that you can use to dodge your enemy, but none of the other maps provide any sort of interactivity the same way Coral Sea did in 1943. Something as simple as a large mountain range would have sufficed. 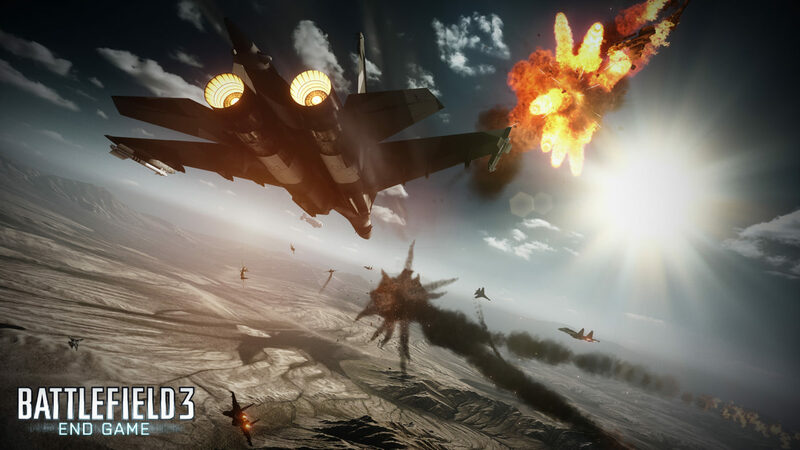 In closing, Air Superiority is a fantastic and essential addition to Battlefield 3, but one that could have used some extra spice in order to retain a greater amount of interest. Conquest and Rush on End Game’s maps play out very similar to maps like Caspian Border and Operation Firestorm from the original game. It’s clear that DICE had these two maps in mind when building End Game’s maps, and that’s not a bad thing. They are big, but not too big. They include just the right amount of space to allow for some seriously epic vehicular-combat, but they keep the action constant so that you’re not always looking for your next fight. Where Armored Kill was a bit of a bore on consoles, End Game gets it just right. Even if some Conquest flag layouts might seem a little big on a couple of the maps, DICE gives you more than enough tools necessary to deal with it. There’s usually a motor-bike at nearly all bases ready to swiftly carry you to your next objective. It makes each map feel smaller, despite their actual size. 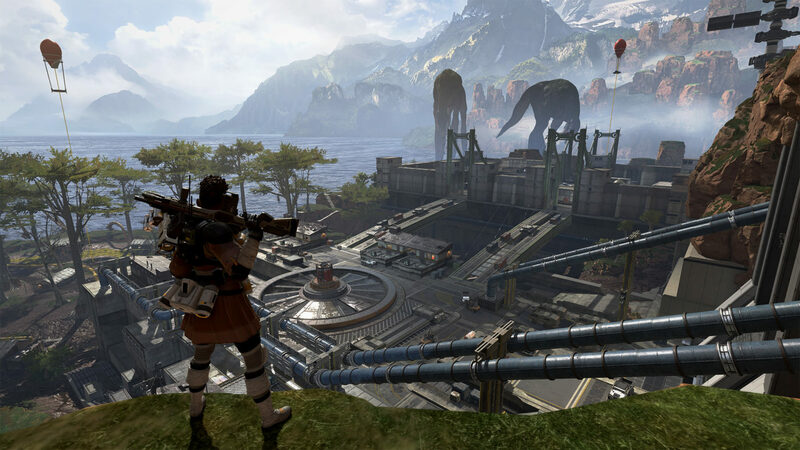 Similar to Armored Kill, however, End Game does give a bit of direction and purpose to the 5-flag Conquest layout by granting the new Dropship aerial vehicle to any team that captures and controls the central flag. 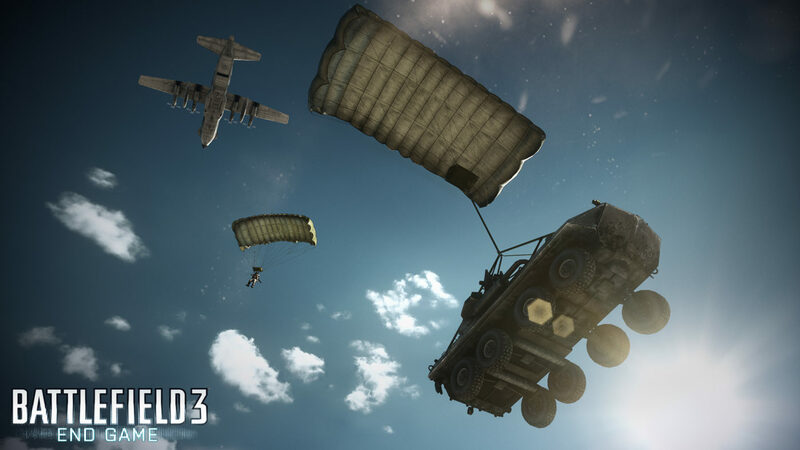 The Dropship, which can be taken out by other vehicles, both aerial and anti-air, plots its own course along the map and allows players to either paradrop from it, or access an additional IFV (up to two on PC) which also paradrops to the ground in its own neat little sequence. 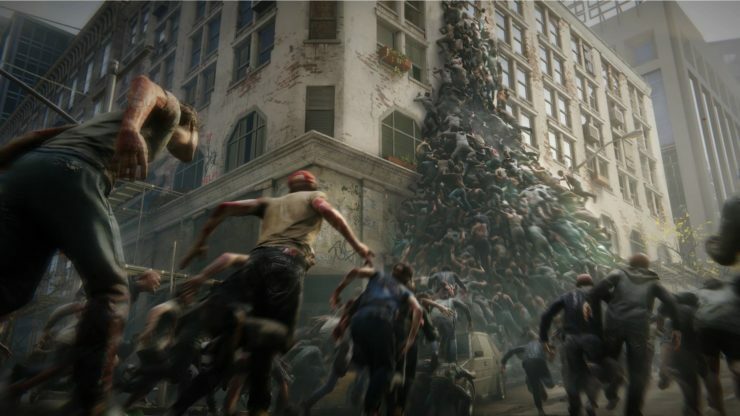 Rush is a blast to play on End Game’s maps. Nebandan Flats and Kiasar Railroad are fairly open and feature tons of space in between each set of MCOM stations in order to give plenty of room for tank vs. tank, chopper vs. chopper, or tanks vs. chopper action. This time around, however, you can say goodbye to the pesky Gunship that plagued Rush in Armored Kill. 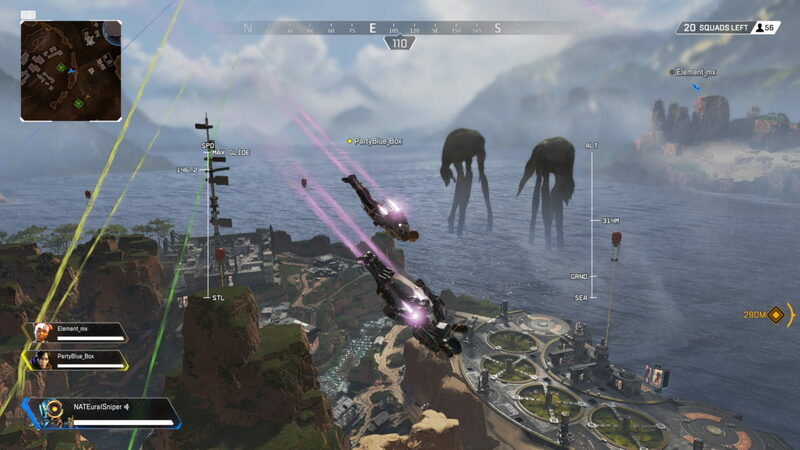 Despite the lack of the Gunship, there’s still a lot of room for aerial combat on each Rush map thanks to the inclusion of the scout choppers. Operation Riverside is particularly fun as a Rush map, reminding me a lot of Isla Inocentes from Battlefield: Bad Company 2. Obviously, the Fall setting is quite similar, but I really enjoy rushing up over the hills and through some of the winding routes between the cliffs and trees, as well as the opportunity for some long range sniper and counter-sniper action. Sabalan Pipeline plays similar in that infantry has more opportunity to stay covered amongst the bushes. Generally, both Conquest and Rush feel similar to Armored Kill, but refined in order to reflect tried and true maps like Caspian Border, Operation Firestorm or Kharg Island. Once again, DICE has done away with or improved upon elements that didn’t work out so well in DLC like Armored Kill. What’s left is a handful of amazing Conquest and Rush maps that also work well with modes like Capture the Flag and Team Deathmatch. Oddly, I found Team Deathmatch to be a particularly attractive choice of game mode on these new maps. DICE has obviously taken what’s made locations like Noshahr Canals TDM and Kargh Island TDM so popular and incorporated it into these new maps. If I had to describe what makes them so successful in one word, it would be ‘crates,’ lots and lots of ‘crates.’ It might seem a lazy choice to simply leave a bunch of crates lying around and call it a good TDM map, but man, does it ever work. Kiasar Railroad might as well be the new Noshahr Canals. It plays exactly the same, but with a fresh backdrop of lush, green pine trees. What keeps me from absolutely loving the TDM version of the other three maps is their focus on ground vs. roof fighting. Call it a personal grudge against roofs, but I hate them. I find them more of an annoyance than something that one must be tactically aware of. There’s nothing worse than getting into a good flow of infantry fighting on the ground, only be be stopped dead cold by a soldier on the roof looking for easy pickings. I find it a waste of time fighting for good positioning on a roof, so you won’t see me going up there, unless I’m going for the grudge kill, which happens often. 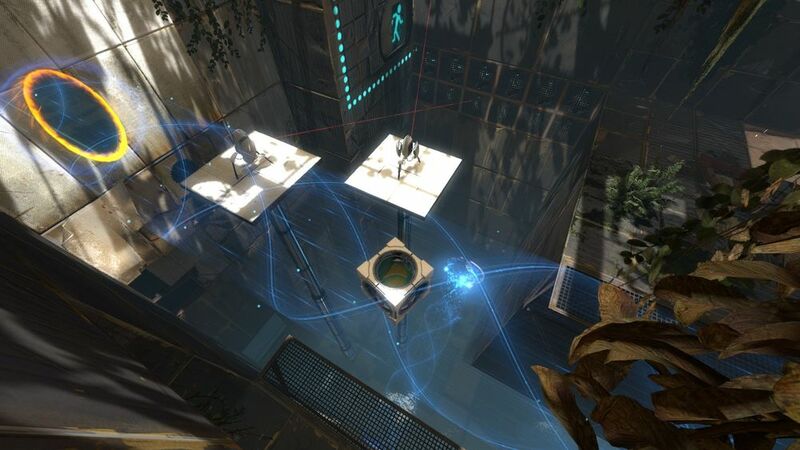 But, generally, I’d easily add these maps to my list of favorite TDM maps. They’re fast, furious, and overflowing with action thanks to some tight spaces and their chaotic layouts. In my books, Battlefield 3: End Game goes right up there with Back to Karkand and Aftermath as some of the best Battlefield 3 DLC (if not some of the best DLC for a first-person shooter, period), and serves as a more than proper close to a year and a half of Battlefield 3. DICE went back to Battlefield 3’s roots to conjure up some of the best maps yet that work well on literally all game types while bringing back some of the Battlefield series’ most classic game modes, and throwing in some of the most enjoyable vehicles to date. 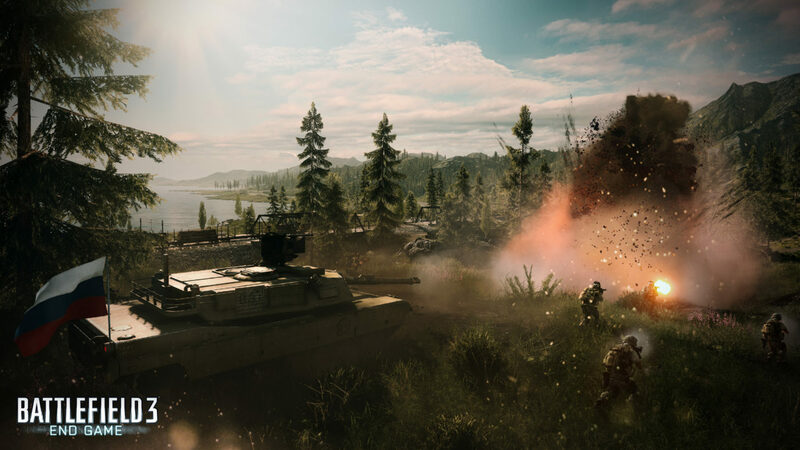 If Battlefield 3’s post-launch support is any indication of what we can expect from the months following Battlefield 4‘s release, we’re in for another fantastic era of Battlefield. Let us know in the comments below what you think of Battlefield 3’s last “hooah.” You can also vote on the right-hand side of the page to let us know how you rate Battlefield 3: End Game.